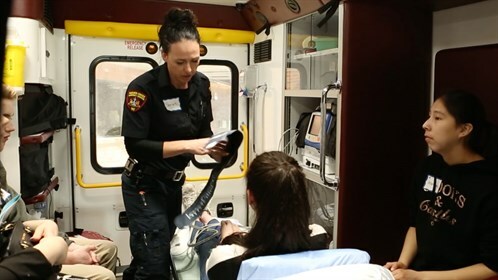 Over 30 keen high school students were introduced careers in rural health care during an April 20 skills day at the Pincher Creek Health Centre. The event was the first of its kind for the town of 3,600 people in Southwestern Alberta, and was done in collaboration with local medical staff, Livingstone Range School Division (LRSD) personnel and the Rural Health Professions Action Plan (RhPAP). John Taylor, an off-campus coordinator for Livingstone Range, said this day had been in the works for years. “This is just part of a larger plan we have to grow health-care professionals right out of high school,” said Taylor, who is part of a forward-thinking group of education, medical, and local government representatives in the area interested in developing career options for youths. He said the vision is to give rural teens a leg up when they get to post-secondary by having completed a course or two in high school, along with volunteering or work experience. It took time to get the skills day together, but collaborating with RhPAP’s Julie Davis helped bring the dream to fruition. Several of the student participants from Pincher Creek, Crowsnest Pass, and Lundbreck said their career goals were broadened and reinforced by having hands-on experience. Meghan Tarcon said the day leaves her wanting to continue to pursue nursing as a career. “I just liked all the hands on [experience], but mostly the suturing because I’ve never known how to do that before and it was really cool,” explained the Crowsnest Consolidated High School student. Addy Halibert is also interested in nursing after job shadowing with her cousin another time. Halibert noted she enjoyed the physiotherapy station, where she saw some of the tools used to assess and improve a patient’s physical ability. She sees herself remaining rural. Mathias Gelber’s father is a doctor at the hospital, which has given him an interest in following the same path. The Pincher Creek St. Michael’s School Grade 10 student said the day’s experience gave him more to consider about physiotherapy and nursing. He wants more of his friends to come to future skills days. “I think if you have that initial impression of having fun in a hospital, but being responsible and doing a job, then it could work out pretty good in the future,” said Gelber. Pincher Creek Councilor Scott Korbett sees the value of the skills day in developing student opportunities. Korbett couldn’t resist, and joined the teens in some suturing. That helped him interact with the students, who he noted were truly interested in health care. “Living in a rural setting does have opportunities you may not think of,” Korbett, a councilor, realtor and tile setter who has lived in Pincher Creek since 1995. “You can do a lot of things if you open yourself to do it, if you embrace what rural settings are,” said Korbett.